If Square Enix had made Far Cry New Dawn, it would be called Far Cry V-2, or maybe Far Cry 5: Hope County Returns. In an unusual twist. Ubisoft made a Far Cry game that was a direct sequel to the last one. 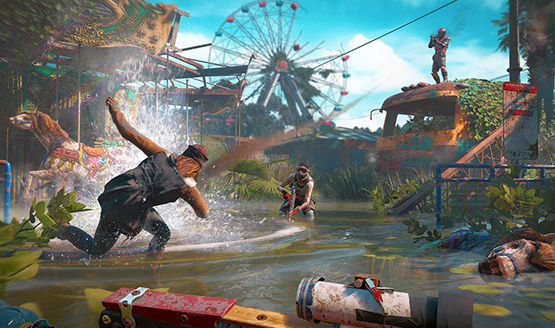 While previous Far Cry games have always contained homages, nods, and references insinuating that all of the games take place within the same universe, Far Cry New Dawn is the only one to follow up directly on the events of a previous game. It might be a couple decades later and you might be playing as a new character, but the things that happened in Far Cry 5 are essential to explaining the world of New Dawn. On the surface, Far Cry New Dawn might seem simply like a post-apocalyptic version of Far Cry 5, and that assumption isn’t wrong, but it only tells half the story. Some of the best beats in New Dawn are ones that can’t actually be marketed, or they risk spoiling the experience. Rest assured that things get a bit more crazy than just handing you the new saw launcher early in the game. About two-thirds of the way in, a nice little twist will actually change the way you play with a new set of perks, so be sure to save a few skill points. It’s worth being able to unlock these new perks quickly when they become available. More than two decades after the bombs fell on Hope County and the rest of the world, the survivors have emerged from their bunkers and are rebuilding their lives. Then come the Highwaymen, a band of roving bandits that want the apocalypse to look a lot more like Mad Max. At the head of the Hope County chapter are two sisters, twins, whose brutality rivals the best Far Cry villains. You arrive looking to help the survivors, and very quickly learn just how unforgiving Mickey and Lou are. It’s soon revealed that the only people who can help the survivors of Hope County is New Eden, Joseph Seed’s mysterious new cult following created in the wake of the disaster. Yes, The Father, the villain you fought so hard against in the first game, might just be your only hope against the highwaymen. New Dawn leans into the “enemy of my enemy is my friend” dynamic, but I don’t think it would be nearly as effective if you had missed out on the first game. The struggle between The Father and the player throughout the hours of Far Cry 5’s story sets up this player betrayal that Ubisoft pulls (even if you are a different character in-world). 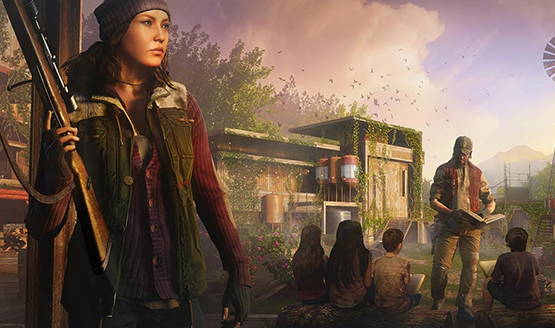 While still an interesting story of how various factions survive after an apocalypse, the larger narrative doesn’t carry the same weight if you hadn’t been in Hope County when the bombs went off. It was fascinating to see people, places, and the aftermath of events from Far Cry 5 play out through some great environmental storytelling. Covering almost the full Hope County map, the world has been transformed in the aftermath of the bombs as new life springs up on top of rampant destruction. The pacing of story missions to world building and side activities means that even though this is a smaller game, it still feels like there is plenty to do and see. Far Cry New Dawn is undoubtedly a Far Cry game at its core (and yes, that means that first-person driving is still terrible), however it does manage to pull a few interesting elements from other games. New Dawn gives the player different tiers of weapons to feel like they are growing in power of the course of the game. Combined with the perks, the experience feels a lot less flat as there’s a goal to upgrade your base and get new weapons to take on more powerful threats in the post-apocalyptic world. Do you like the saw launcher? Then you’ll want to aim for getting the higher tier versions of it that are not only more powerful, but can have different effects. The same is true for every weapon type, and Legendary weapons feel like something special that was earned. 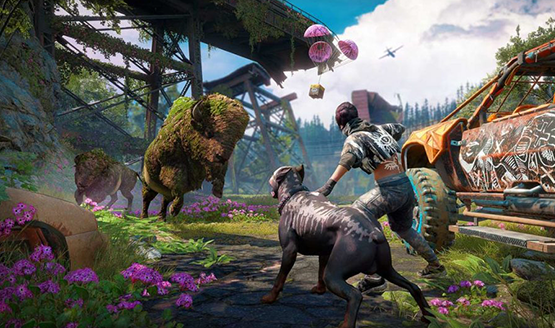 The world will keep up with your growing power though, challenging you through Far Cry New Dawn’s endgame. It’s weird to talk about a single-player open-world game as having an “endgame,” but there’s not really a better word to describe how New Dawn’s world continues to challenge the player. Three tiers of difficulty on all of the expeditions and outposts promote replayability in the same way you would replay and grind out something like Destiny. Granted, it’s somewhat limited because Far Cry New Dawn is not inherently a loot-based game, but it does make the grind to level up your home base have a little more variety. The gameplay loop kept me interested far longer than previous Far Cry games have, and for something that is designed as a smaller “in-between” game arriving so quickly after Far Cry 5, I was surprised at how much time I was able to spend with it. Similarly, Expeditions allow players to step outside of the open world’s bounds to travel to other locations ravaged by the aftermath of the bombs. Alcatraz, a theme park, the Grand Canyon. There are seven different expeditions, each with their own specific theme. Rising difficulty and randomized elements keeps these feeling fresh no matter how many times you play them. Your landing zone can be different each time, and the location of the package will also change, so don’t expect to just easily run through these, especially on the tougher tiers. One high-level expedition even tossed a legendary bear into the mix, causing some chaos for both me and the enemies trying to gun me down. Where expeditions falter is in the use of their unique environments to do anything interesting. Randomized elements aside, they are basically a wave-based survival mode. Once you find the package (which is marked by a plume of pink smoke and a beeping sound), you have to survive for about two and a half minutes before escaping on the helicopter. I would have liked to see more unique gameplay elements come into play within each of the distinct environments, like having to activate a roller coaster to collect the package in amusement park. Apart from a specific Trophy requirement in the downed government plane expedition, there’s no real reason to explore these environments. They are just backdrops for the wave-based survival. There is once again an interesting cast of characters to recruit to your side, each of the eight with their own specialty. Hurk Drubman makes a triumphant return, now a father and still an expert with explosives. There’s a new dog that you can train to be a killer. And there’s the mysterious silent masked man known as The Judge (who actually has a very, very interesting backstory, should you care to read into it within the game). In Far Cry 5, using these allies became a crutch, making the taking of outposts far too easy. While that’s true early on in New Dawn, higher difficulty tiers will require you to be a little bit more smart with how you play it out. You can’t just send your massive boar in to wreak havoc or he’ll end up cut down in no time. Far Cry games have become infamous for their non-action endings, secret endings that are essentially rewarded for doing nothing. In Far Cry 4 it ended up being a brilliant subversion of the action mindset of most gamers. By doing nothing 10 minutes into the game, you learn the twist of the ending and allow the credits to roll. Far Cry 5 had a similar one, where you could simply walk away from the inevitable in the beginning by refusing to arrest Joseph Seed, but it also opened up two divergent endings at the conclusion of the game. While playing a Far Cry game, I’m basically looking out for opportunities to do nothing now. There were three distinct instances in Far Cry New Dawn where control is handed over to the player to do something and you can choose to not take action, but I was never rewarded in any way, at least not overtly. The inclusion of these little Easter eggs isn’t enough to make or break the game. I did come away disappointed when my decision to do absolutely nothing wasn’t acknowledged in a bigger way, especially because the game sets these moments up to mean something. Perhaps they are only designed to mean something to me as the player, but when I’m playing a game I like to see cause and effect play out. Microtransactions are back in Far Cry New Dawn, allowing players to purchase Far Cry Credits that can be used for various things. Everything from cosmetics for your character to new and more powerful weapons can be purchased using these Credits. You can even buy perk points to unlock perks, shortcutting the need to earn them through regular gameplay. For the record, the progression in New Dawn is not stunted because of these microtransactions. Had they simply been lifted out of the game, I don’t think Ubisoft would need to rebalance any of the progression. Just through regular play, I was able to unlock all of the perks and craft every weapon that I wanted to use. While many may feel that microtransactions have no place in a single-player (well, technically co-op) game like this, they have absolutely no impact on the game should you choose to ignore them. I do find their placement to be quite silly, considering you can actually find a limited amount of Far Cry Credits in the game world itself. But if people want to spend a couple bucks to shortcut their way past a very fair progression system, that’s on them. Being able to spend real-world money in Far Cry New Dawn had no bearing on my experience whatsoever. 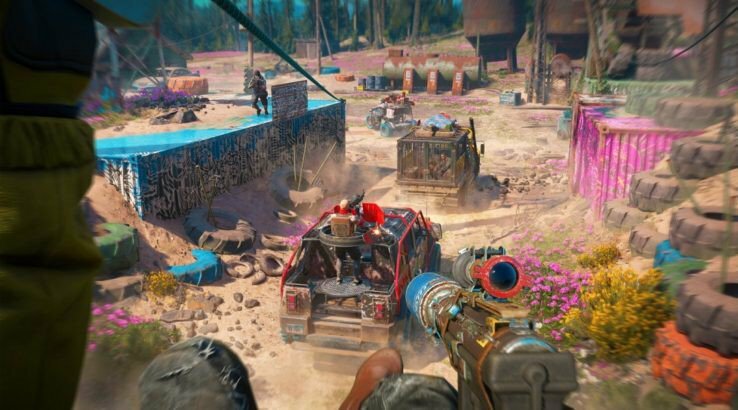 Far Cry New Dawn is definitely another Far Cry game, though the changes it makes to keep everything feeling fresh are intriguing. a very light RPG touch makes much of the typically repetitive content feel new with a difficulty curve that will challenge how people play. While it can be played independently, Far Cry 5 and New Dawn together create an interesting story package featuring some great twists, turns, and betrayals of the player (even if those pesky convenient macguffins keep coming into play). Coming less than a year after 5, New Dawn does retain some of the sins of its predecessor, but it still managed to make enough new inroads to keep me hooked until the end. Far Cry New Dawn review code provided by the publisher. Version 1.01 reviewed on a standard PS4. For more information on scoring, please read our Review Policy. People, events, and places from Far Cry 5, now with an apocalypse!